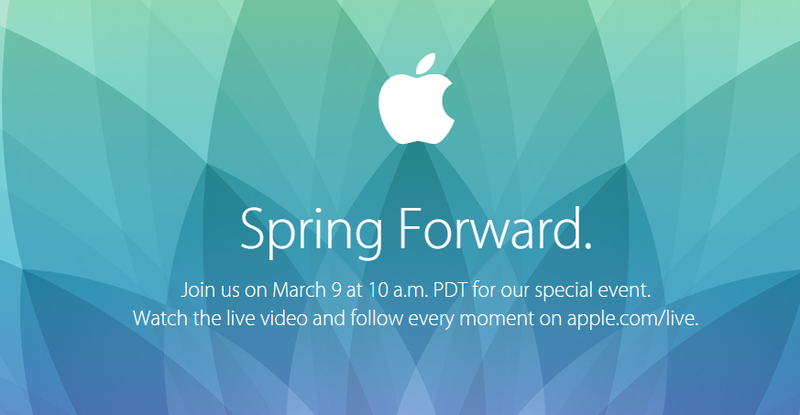 9th March is a day dedicated to Apple’s ‘Spring Forward’ event, where Apple will showcase its much-waited Watch line and all the shipment details along with its cost. However, Spring Forward event does not solely unveil the Apple Watch, but all other gadgets which are expected to be announced. Apple’s time-themed event in San Francisco will fill the details on its Watch series which was first announced back in September 2014. What we know of Apple Watch yet – it will be ready to ship in April and the basic glass with aluminum variant costs $349 in the US and prices to other regions are yet to be announced. What we’re not aware just yet is what the high-end variants will cost, like the stainless steel midlevel Apple Watch which comes with a Sapphire Crystal display and the 18 Karat gold version which is directly associated to fine jewelry. Other than this, we will also get a firmer insight on the battery life of the Apple Watch along with the applications available at launch. The last update of Apple’s Airport Extreme and Time Capsule is June 2012 and 2013 respectively, and we’re pretty sure they will have a modernized look and utility. Hence we can anticipate their arrival in the form of updated hardware on this Spring Forward event. Although we have all fingers crossed but it is expected to see new and improved iPod fronts. Abundant iPod series were introduced in the past with some made redundant while others get a price decrease.The 5th Generation iPod Touch was debuted in September 2012 along with the 7th Generation iPod Nano and there was a major price decrease in Touch series in 2014. iPod Classic was last upgraded to 160GB which was officially dropped. iPod Shuffle 4th Generation was introduced in September 2010 and we still haven’t heard from it. All of these older generation iPod models were hoped to release in Apple events, this or the other but Apple failed the expectations we kept. The highly anticipated Macbook Air Retina along with a refreshed Macbook Air model has a chance to finally drop by this year. Its been quite a while since Apple has updated its Macbook Air model and this year there have been rumors of a design change, internally and the retina version. One of the most speculated model is a 12 inch model squeezed into the body of an 11 inch Macbook Air. Probably resembling the Dell XPS 13 or the swazzy Samsung Ativ Book 9. The update would most likely to come with Broadwell CPU and a bazelless display. Apple passed to update its Apple TV Box for three years and this might be the event where we see a new updated version. I know people have given up on Apple Television but with an update and improved UI the TV Box could make a comeback. It might not be wrong to say if Apple would put a gaming addition to its features along with other numerous applications. But as we speak, there have been no changes in the controller nor does the box. There were many leaks and rumors of an even bigger iPad in the works but considering the emphasis of the general public in iPhone 6 and 6 Plus, Apple’s suppliers lack the bandwidth to manufacture. However, its most likely to debut in the March 9 Spring Forward Event. One more thing, since Apple is the world’s most valuable company, there are always mind bobbling surprises. Apple has a style to produce state of the products and one such rumor suggests Apple working on an electric car that we might expect to see in 2020. Let us know if you think some Apple products need to be updated.